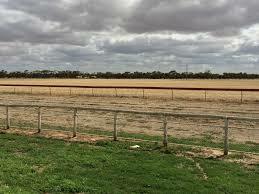 I’ve been reminiscing about horseracing and the tracks I’ve visited such as Randwick, Oakbank, and Port Augusta. But beyond Victoria Park, Clare, and Singapore, there’s one that holds a particular place. The publican’s boyfriend stood in the dock. He was a bikie who showed dismal regard for the court. The prosecutor shuffled his papers and then continued. “Behind the front bar of the Iron Knob Hotel the police found firearms and drugs. You’ve admitted these belonged to you. Is this correct?” The bikie nodded. The court found that the bikie’s girlfriend wasn’t fit to hold a license, and she was given three months to sell the only pub in the outpost of red dirt and bemused kangaroos standing in the moonlit main street as you weave past in your sad little car. Welcome to Iron Knob. Population: 180. The Middleback Ranges on Eyre Peninsula has been mined for many years. West of Whyalla and about an hour from Kimba a fifth of the steel required for the construction of the Sydney Harbor Bridge was quarried at Iron Knob. Other local ore bodies are at Iron Monarch, Iron Prince, Iron Baron, Iron Knight, Iron Princess, Iron Queen, Iron Chieftain, Iron Duchess and Iron Duke. Local stalwart Bryan Lock, from the Iron Knob Visitor Centre confirmed that, “150 million tonnes of high grade ore came out over one hundred years.” I wonder if any future mines might be named Iron Gloves, Iron Butterfly or Iron Chef. Among my old mates it’s a notorious item of clothing, and we talk about it more than we should. Fresh from the drive across Eyre Peninsula, Paul banged on my door. “How’s the trip?” I asked. We shook hands. “Not bad. 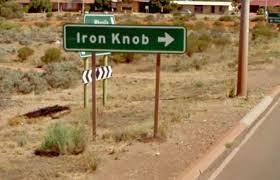 I stopped at The Knob.” Iron Knob is sometimes, simply, The Knob. “And I bought a souvenir.” Hmmm, I thought, like sending a postcard from your proctologist’s. Paul loved that singlet. Every spring he’d drag it out. Over the years I saw him in it at the MCG and on Coolangatta beach. He also packed it when we went to Vegas, the Grand Canyon and California. Wearing it today, I doubt he’d be allowed into Disneyland. It was the first country race meeting I attended. I recall crushed Southwark cans mingling with the dust, and Akubras on every second squinting head. There was an energetic crowd of gnarled types, and blue-grey saltbush stretching across to the hills where The Sundowners was filmed over five decades ago with Robert Mitchum and Deborah Kerr. Legendary bush jockey Phil McEvoy came from Streaky Bay, and made his debut at Iron Knob in 1970. He saluted. Three decades later his son Kerrin piloted Brew to victory in the millennium’s first Melbourne Cup. I was at The Iron Knob Cup with friends from Kimba. We stood about on the edge of a cruel desert, but happily trapped within the racetrack’s exhilarating world. Gareth and Netty trained horses, and competed in equestrian events, and Gareth was the showjumping course builder at the Royal Adelaide Show. Netty’s father Arthur was a famed horseman, parliamentarian and one of the “Rats of Tobruk,” and if you asked Netty whether she’d rather a month in Europe, or a month at outback race meets, she’d answer immediately. No passport required. I couldn’t tell you who won any of the races, or even The Iron Knob Cup. I doubt I bothered the bookies at all. But there was something strikingly elemental and persuasive about that place for it evoked a time long forgotten, when the men all wore porkpie hats and “madam” featured courteously in conversations, and cars didn’t have air-conditioning, and so, as kids in the back seat, we wound down the Kingswood’s windows, welcoming in wind and flies and the baked, shimmering earth. The town had a peak population of 3000, and there were 800 residents when the mine closed in 1999. Within weeks it shrivelled to one hundred and fifty. Many of the shops and houses remain boarded up. Wardy’s take away food business is closed, and a for sale sign points sanguinely to its peeling façade. Iron Knob’s annual race meeting is now gone. Today, the mine has re-opened and employs about thirty. In a few, fleeting years the ore will be finally exhausted, and then like Coward Springs, Radium Hill and Yudnamutana the town will quietly expire. But, for now, the Iron Knob Tourist Centre sells tea towels, and has a gem bar. There’s a dusty School Dux Board on its wall. I doubt it, but hope they still sell G’day from Iron Knob singlets. Trevor Lucas would like this town. He could add in the word “Iron” as an adjective to his favourite saying. Could possible be true.